April 29, 2014 will have a annual solar eclipse. This is exactly 2 weeks following the Passover Blood Moon of April 15, 2014. According to http://www.timeanddate.com, An annular solar eclipse can be observed when the Moon moves centrally in front of the Sun, but it is so far away from Earth that it appears smaller in the sky and cannot cover the Sun completely. 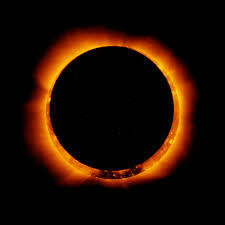 The Sun’s outer edges are then still visible and form a “ring of fire” around the Moon. Below is a photo from NASA’s site of an annual solar eclipse. Does it remind you of Johnny Cash’s song, “Ring of Fire”? Well……………April 29, 2014 is a date that US Secretary John Kerry and President Obama set as a deadline for Israel to come to peace with the Palestinians. John Kerry has warned Israel that they will encourage boycotts if an agreement is not reached. I am praying that the US is not setting themselves up for disaster. Obadiah 1:15 (NLT) “The day is near when I, the LORD, will judge all godless nations! As you have done to Israel, so it will be done to you. All your evil deeds will fall back on your own heads. Bill Koenig of Watch.org has written a magnificent book of accounts of every time the US pressured Israel to give up land, a historic weather catastrophe happened within 24-48 hours. Eye to Eye – Facing the Consequences of Dividing Israel. This is a must read for the times we are now in.